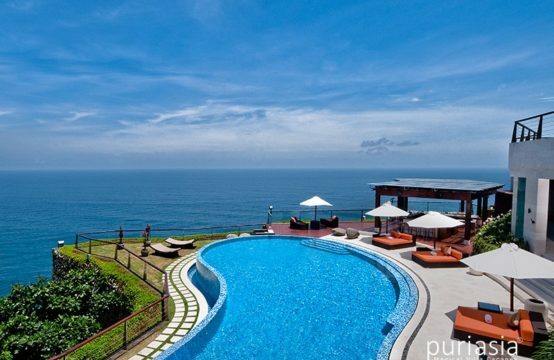 Villa Bidadari Cliffside Estate is one of the premier ocean view rental villas in Nusa Dua Bali, dramatically located on the cliffs edge overlooking the Indian Ocean. This unique privately owned Bali luxury vacation home encompasses both visually arresting contemporary styling and Balinese essence. Villa Bidadari offers 3 spectacular ensuite bedrooms in the main residence. A 4th ensuite bedroom, a Balinese style luxury Cabana, is located beachfront on the bottom of the cliff, accessible by the private inclinator or steps. The main residence of Villa Bidadari Cliffside Estate is spacious in scale and fitted with unique exquisite artwork as well as locally produced, high quality furnishings. The sunset cliff location offers breathtaking views of the Indian Ocean through the floor to ceiling glass doors of the living room and upstairs master suites. The Bale, which serves as an outdoor dining and contemplative venue of this luxury Bali villa, overhangs the cliffs and sits next to the 18 metre infinity pool. The view from the ironwood deck appears as though you are at the oceans edge. The upstairs master suites are decorated with wonderful local modern furnishings, each with outdoor Japanese soaking tubs to complete the feeling of pampered luxury. The fourth bedroom suite, a separate romantic Balinese style Cabana is nestled into the hill on the bottom of the cliff and perched just steps above the white sand beach and crystal blue ocean. One can access the Cabana by walking down the Bidadari Cliffside stairway or riding the only private inclinator in Bali, exclusively designed for this ocean view villa Bali -style. The Cabana offers a true relaxed Balinese luxury experience with striking views of the ocean as well as a secluded outdoor shower. Villa Bidadari Cliffside Estate also provides a gym situated underneath the Cabana, 2 kayaks and a colorfully painted Balinese style outrigger canoe. The gym area also functions as your own Bali private yoga retreat where you can meditate in your private peaceful space overlooking the Indian Ocean. A true Balinese culinary experience awaits you with Ketut, our talented resident chef at Bidadari Cliffside Estate. Ketut will prepare and cook for you delicious dishes from around the world. Ketut is also available for private cooking lessons in the art of Indonesian cooking. 4 air-conditioned double Suites with king size beds, TV, ensuite bathrooms. 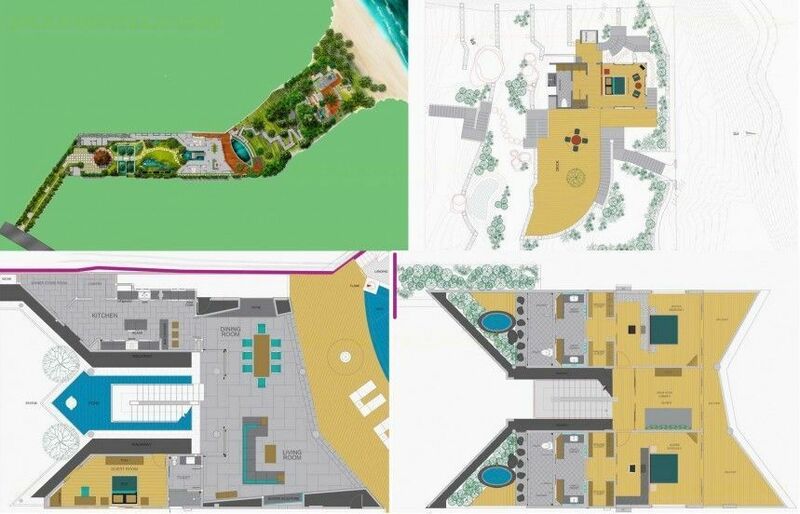 3 bedrooms in main building, 1 luxury Balinese style Cabana above the beach, outdoor bathtub in 2 upper Suites, safety boxes. Air-conditioned Indoor dining area, Clifftop dining pavilion with spectacular 180 degrees ocean view, Air-conditioned Media Entertainment & Library room with widescreen TV and large sofa. Bidadari’s iconic chef Ketut is passionate about preparing delicious & fresh cuisine. The villa offers an extensive suggestion menu of delicious home-style meals featuring Asian and international dishes to cater to all tastes, with a wonderful selection of vegetarian and children’s options. The chef is also more than happy to tailor meals to accommodate any special dietary requirements. Groceries and beverages are charged at market price (plus a 20% handling fee). Facilities include a fully equipped kitchen and Weber BBQ grill. Rates are subject to 15.5 percent tax & service charge. *The rate is subject to 15.5 Percent Government Tax and Service.